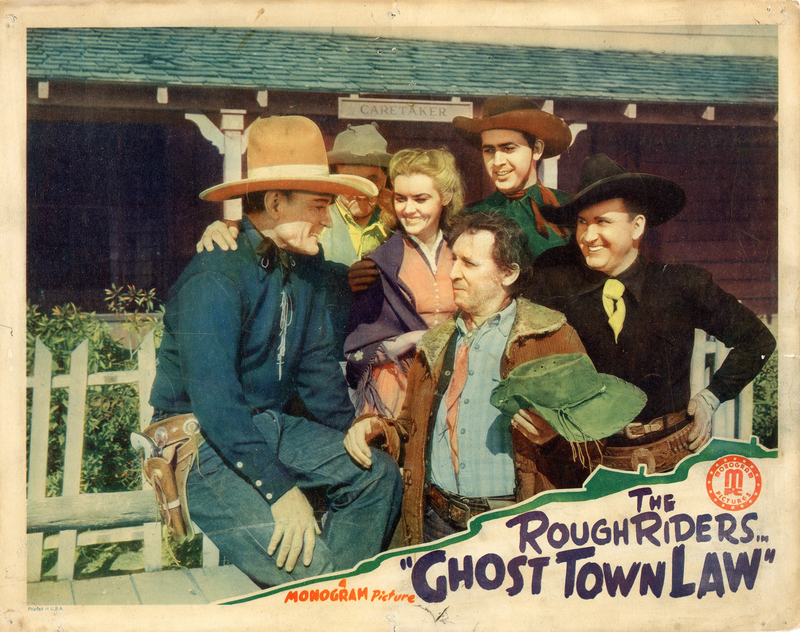 SCVHistory.com LW3003 | Melody Ranch | The Rough Riders Star in 'Ghost Town Law' (Monogram 1942). Monogram's Rough Riders — Buck Jones, Tim McCoy and Raymond Hatton — star in this buddy picture from 1942, "Ghost Town Law." Lobby card, 11x14 inches. The film was shot on location at the Monogram Ranch (later called Melody) and on the Walker Ranch in Placerita Canyon. Set decoration and technical directing by Ernie Hickson, owner of the Placeritos (Monogram) Ranch. In the 1940s, when the box-office appeal of the big stars of the 1920s and 1930s such as Hoot Gibson and Buck Jones began to fade as their original audiences aged and outgrew them, Monogram producer Scott Dunlap teamed them up in dozens of in low-budget ("B" Western) "buddy pictures" in an attempt to triple the attraction. This was one such film. Released domestically March 27, 1942, "Ghost Town Law" was also one of Buck Jones' last films. Dunlap, the producer, was unwittingly and regretfully responsible for the fact that this was one of Buck Jones' last films. See below. LW3003: 9600 dpi jpeg from original lobby card purchased 2017 by Leon Worden.